If you'll be in Boston July 21-25, you're in for a treat. Ramsay Park, near Northeastern University, will be home to the first annual AfrikCan Festival next month, showcasing many facets of African culture, and of course that includes plenty of great music. The festival aims to offer a broad perspective on all the good things going on in the continent, spotlighting different African cuisines, African fashion designers, and other art forms. The lineup looks excellent, featuring several Afropop favorites like Antibalas, and includes artists with African backgrounds who work abroad, as well as artists living and working in Africa. 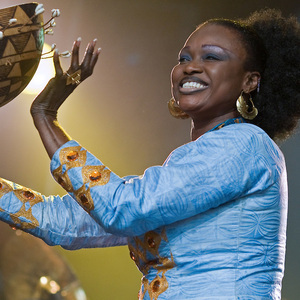 There's also a good range of genres on offer, from DJs (Black Coffee) to reggae artists (Ivory Coast's Alpha Blondy), as well as Nigerian pop star Wizkid, and the Grammy Award-winning Malian musician Oumou Sangare (featured in the photo above).We put together a short playlist with tracks from some of the artists who'll be performing to give you a little taster of what's on offer. Tickets for the five-day festival are a bit pricey, though well within normal range for an event of this scale, but the day passes are affordable, and either way, it looks like you'll get your money's worth. So if you're in the area, check it out and let us know how it goes!